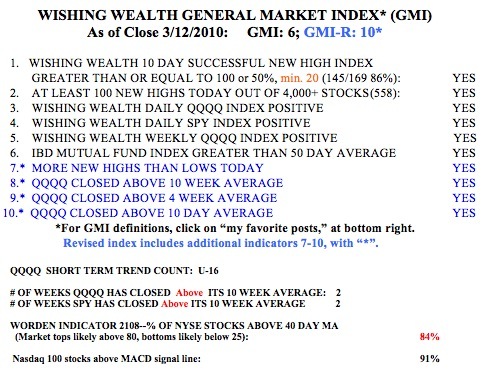 the QQQQ completed the 16th day of it short term up-trend on Friday. Both the QQQQ and SPY index ETF’s closed above their 10 week averages for the second straight week, a sign of strength. The only caution signs I see right now are the fact that 91% of the Nasdaq 100 stocks closed with their MACD above its signal line and the Worden T2108 indicator is now at 84%, not far from the highest levels it gets to. So, in order not to lose my profits gained in this up-trend, I am moving my sell stops up a little. Remember, in ancient Rome, the lions ate up all of the prophets! Did you notice what happened to KCI last week? On March 1, I wrote that KCI looked like a bullish cup-with-handle pattern. It’s up about 17% since then. A reader asked me if it was dangerous trading the 3x ultra ETF’s, like TYH. Yes it is, but only if I have too large a position and do not have a suitable stop in. Since these ETF’s are designed to move 3x the daily move of the stocks they track, I always tiptoe into my position by buying in small amounts and averaging up. So, I might start with buying a few shares and only add more after the ETF has moved up. I try to enter at the beginning of an up-trend, when no few typically expect the market to begin a sustained rise. It is at such times that I am most scared to go long. If I had the discipline to just buy the TYH when my QQQQ short-term indicator turns positive, I would do quite well. For example, the current QQQQ up-trend began on 2/25 and QQQQ has risen by 6.2%, while TYH (the ultra 3x bullish tech ETF) has risen 15.5%. Yes, TYH moves quickly, but I believe the actions I noted above bring the risks down to an acceptable level for me. Will health care law passage torpedo the market? Stops are in. Anyone who follows jim cramer (total crook) and any of his so-called advice is doomed to start with. They might as well take their money out in the backyard, put it in a pile. Then light a match…. Frankly, I can’t stand Cramer, but I failed to do is explain his opposition. I believe stops can be an excellent strategy, but they aren’t in all cases. A case in point where one might set a stop below an obvious support and the stock has average volume less than maybe 300-400 thousand on average. While this isn’t exactly a thinly traded stock, its quite common for a stock at support to sometimes reach down 1-2% below support to clear out the stops. This isn’t by accident and if it happens at all seems to occur more often in the earlier trades of the day. One can say they’re just setting stops too close to support, but 2% away? More widely traded stocks are harder to manipulate due to the sizable volume. Any new thoughts or blog post on the stop loss strategy after the flash dip earlier? What was your experience during that phase? Personally, I keep mental trailing stop loss, baised by some observations attributed to Zweig. I love Cramer and attribute my consistent performance of beating the averages to him. Regarding stop loss strategy, I DO NOT use it and have benefitted greatly. Specifically, during the flash crash. Quite the oppostite. I had a handful of limit buy orders in at the time. All of them hit and immediately bounced back. A huge gift and I wouldn’t have had that strategy without Cramer! Easily, the best teacher of investment strategy for the average person. The proof is in the results and I’m much better off for listening and reading Cramer’s books. Cramer is an idiot. On his 7/12/12 show, he told a Tyson employee that he SHOULD NOT buy TYSON company stock w/ the 25% “match” they put in. This is the second time I’ve e-mailed Cramer w/ this dumbass advice (prior was the same thing on Home Depot a couple years ago). He fails to answer, nor does he discuss it on his show. Where can you go and get an AUTOMATIC 25% return on your investment? I got a 15% kicker as a Wal-Mart affiliate employee and made 150%+ over 9 years in the plan. I just wonder where his fans are when they have to realize the above.